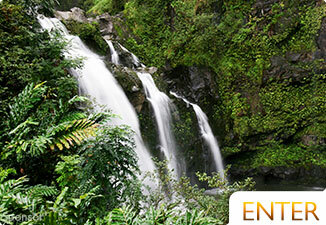 The Road to Hana is world famous for the natural beauty of its unblemished landscapes and towering waterfalls. Maui is understandably proud of Heavenly Hana's successful fight against overdevelopment and the destruction of their Hawaiian culture. When you make the trip over to Hana Maui, you'll see why it's referred to as The Land That Time Forgot. Having an air-conditioned vehicle with a driver/guide is really the best way to see Hana. There's no stress involved when a knowledgeable driver points out and stops at the most beautiful spots. Leave the driving to someone else and enjoy the ride with your family. We highly suggest using Valley Isle Excursions by calling toll free 1-877-871-5224. They will take you to all the best spots, feed you, pick you up and drop you off at your hotel, and answer any questions as your driver guides you through paradise. We love their elevated comfort cruisers that give you the best view possible. 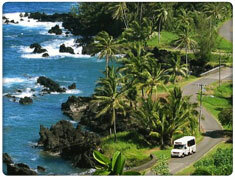 See more about Road to Hana Tours. There are a few different guided CD's for Hana, but only one of them delivers the full experience. 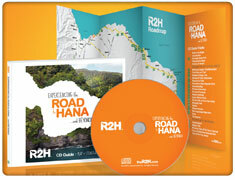 When using R2H's Experiencing The Road to Hana and Beyond, you're getting an adventure through Hana. You're brought to the Hawaii you've always envisioned existed beyond the hotels and luaus. 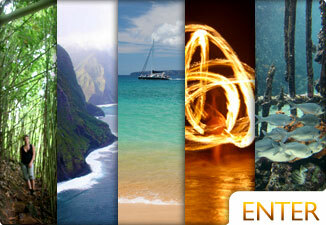 With R2H, you're on a journey of romance and adventure along one of the most famous and memorable trips in the World. You're given driving tips, a wonderfully mastered CD guide, and a detailed map showing specific locations to stop. You get it all, but you get it on your own schedule. Learn more about the Road to Hana CD. Without a doubt, the best way to enjoy Hana is by staying for at least a few days. With an overnight stay, you'll miss the masses and have plenty of time to appreciate the beauty around you. Most drivers leave early in the morning and drive back a few hours before dark, which means you have 2 large windows of time each day with very few people around. 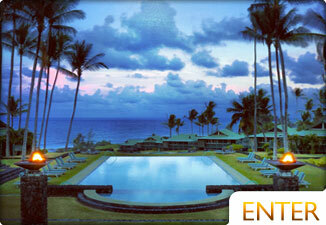 Our first choice is to stay at Travaasa Experiential Resort in Hana Town. This amazing property is located right on the ocean with an award winning spa, beautiful pools, and everything you'd need to enjoy Hana. 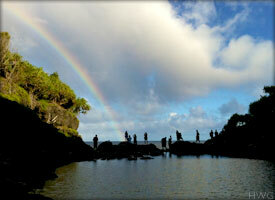 Camping in Hana is another option, though be VERY prepared for overnight rain. Don't expect to stay dry overnight with even a heavy-duty tent (we've woken up drenched even with a tarp over the tent.) Now we opt for staying at the Travaasa. 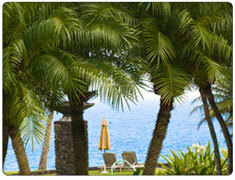 Learn more about Hana Accommodations. 4. Bring or rent a camera with plenty of memory card space (or film). You'll no doubtedly get some incredible pictures along the way. It's the worst getting to a great spot and running out of disc space, having to delete other good images, or realize your battery is too low. We highly suggest renting your photo equipment while visiting Maui. You can get much nicer equipment than you currently have, plus you don't have to carry it on the flights. Call them beforehand and reserve your photo gear for when you arrive. 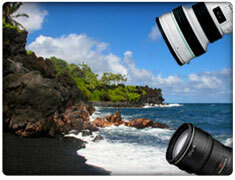 We've used Hawaii Photo Rental's equipment and love their selection and prices. Call (808) 735-3838 for delivery anywhere in Hawaii. 5. Rent a convertible car. Maui is great for convertibles, but the Road to Hana is the best part. If you drive with the top down, be prepared for a better viewing experience, a few more bugs, and a 99% chance of having to pull over at one point or another for rain. When you do pull over, get off of the road completely. Also, do it slowly and safely. Getting a little wet is worth your not going off a cliff or hitting another car around a bend. Wait till it's safe to pull over. If you don't think you are willing to get a little wet, keep the top up. 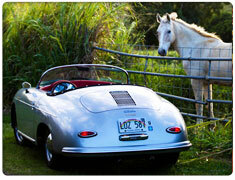 Most rental car companies offer convertibles, but what sets Maui Roadsters apart are their iconic, fun to drive 1957 Porsche Speedster reproduction rentals available for 4 and 12 hour adventures. 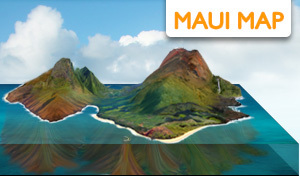 See our Maui Car Rental Guide. 6. Drive the backside of Hana. Just because it’s called the Road to Hana doesn’t mean the road actually ends in Hana. For an extra fun, slightly more off the beaten path adventure, continue driving past Hana for a breathtaking view of the lesser visited side of Maui, including stops such as Wailua Falls, ‘Ohe’o Gulch (Seven Sacred Pools), Charles Lindbergh’s grave at the Palapala Ho’omau Church, and eventually, Kaupo General Store and Grandma’s Coffee House in Upcountry. 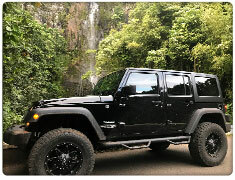 While drivers should be aware of narrow pathways and steep cliffs, we highly recommend driving this section in a vehicle that’s equipped to handle it, such as a new Jeep Wrangler from the pros at Maui Lifted Jeep Rentals. 7. Don't try and pack everything into one day. One thing we often see tourist do is rush from one site to the next. I guess this is a common characteristic of the average tourist: Conquer all the sights possible! Get on island-time and choose a few things to see ahead of time, or just wing it, and stay where you like. You'll have a much more pleasant time by soaking in a couple falls and doing some swimming with a picnic lunch than you would by rushing to every waterfall. If you follow our advice, you'll notice other Maui visitors stopping for a couple peaks then rushing off to the next. For many visitors, visiting the first waterfall at Twin Falls is enough to get their fill without driving around the entire island. If you stay at one place for long enough, you may find yourself completely alone with your own piece of heaven. Take half the day to hang out at Hamoa Beach or explore the little town of Hana for good food and souvenirs. Besides all of this, getting to Hana should not be your main objective. There's a reason they call this incredible experience “The Road to Hana.” We recommend you drive and see things until you feel you've had half of what you want, and then turn back. It's all about the journey, not so much about the destination. Shake off the mainland, and learn how to relax. Your friends back home will notice that you've gained more than just a Tan while in Maui. 8. Don't leave valuables in the car. This goes for anywhere in Maui. You may notice when you park in the dirt at certain sights that there's broken glass on the ground. The vast deep vegetation of your surroundings is the perfect place for Maui thieves to sit and wait for unsuspecting tourists to pull up. Leave your valuables at home. Even the trunk of your car is not safe from a determined thief. Remember that Maui rental cars are easy to spot, and make for obvious prey. Don't take any risk of being a victim, and instead leave your valuables at home or take them with you from the car. It's not as bad as we make it sound, but it's also better to be safe than sorry. Hana is packed with mosquitoes and other unfriendly buggers. They tend to congregate near streams and still water as well as near fruit trees. If you see fruit rotting on the ground, you can be assured that hundreds of mosquitoes are having a good old time on them. If you're hiking, remain on the regular paths. 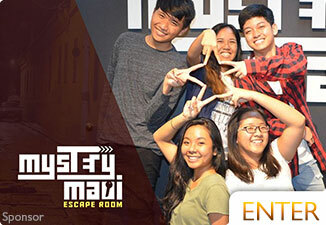 Follow them for your own safety and to keep away from the bugs. You'll get more bites walking through grass and shrubs than you would on a flat dirt path. You also are less likely to trespass or run into a spider web. Even though we don't have snakes in Hawaii, the spiders are all over the place. All of the hiking is superb in and around Hana. Bring hiking shoes that you don't care much about. You may find yourself traversing streams or walking through thick mud. If you're prone to bug bites, wear high socks and bug repellent. Decide ahead of time where the best places are to go and pick one of the hikes. 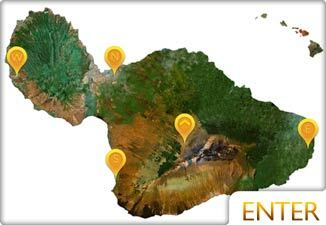 The best way to find a hiking trail that you'll never forget is to ask a Maui local to recommend one to you. 12. Drive slowly and take turns at the wheel. The road to Hana is dangerous. With approximately 600 curves and 54 bridges, the Road to Hana can bring you closer to heaven in more ways than one. With winding roads, blind turns, constant traffic, distracting views, narrow one-lane roads, cliffs, and wet conditions, Hana Highway has proven its worth as a danger with many fatalities. Take your time, and make sure the driver is focusing on the road. The road is long and offers many chances to pull over and take a break or switch drivers. Remember: Getting to Hana is not the gem of this trip; everything along the way is your reward. 13. 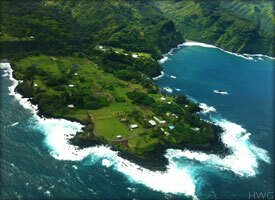 Research a Road To Hana Map and pick your stops before. Buy a map, print on from the web, get a book, or pick up some free maps and guides at the magazine and pamphlet stands. Read up on the spots that interest you the most and write down the mile marker. If you know where you'd like to go before hand, you won't miss anything important to you. Just because the Road to Hana is FREE, don't use this as an excuse to see everything. It's in your best interest to absorb a few of your favorite stops along the way instead or rushing through the journey. See our Road to Hana etiquette below. This is an important tip. An angry Hana local can ruin your trip really quickly. 15. Get the banana bread. Some of the roadside stands are better than others, but all of them are good. They bake their breads fresh everyday, and sell so much of it, that they often bake through out the day. Fresh Hana Banana Bread usually runs around $5 per loaf (as of this writing February 2018), but is a delicacy while on the road. We recommend stopping at the Twin Falls farmstand. The earlier the better. The Road to Hana is full of tourists throughout the day, but if you leave before them, you can beat the crowds. We suggest that you get up early and drive to some of the last sights along the way and work your way backwards. Another way to do it is drive the backside of Haleakala first (if the road is open) and go in the opposite direction. 17. Get back before it gets dark. Driving the Road to Hana isn't fun in the dark. The whole point of making this journey is for the sightseeing, so give yourself a couple hours to leave before darkness falls. 18. Bring rain slicks or at least a towel. Hana is lush and tropical for good reason. Hana is one of the most rained on places on Earth, so be prepared with something to dry off with and some protection if you plan on walking around a lot. 19. Don't swim at the top of a waterfall. You've seen pictures of people basking on the rocks and swimming in a pool above a waterfall. Some of these spots have been closed to the public because of fatalities. Others are still open, but dangerous. This warning is not reserved for just the big waterfalls. One of our editors knows from experience how dangerous some of the smaller ones are. He was swept over and almost killed by a seemingly harmless fall. 20. Check the weather service. If it's been raining a lot lately, there could be flash floods. These floods come without warning and are extremely dangerous. They originate high in the hills and mountains, so you could be sitting in the sun one moment and swept away the next. This is very important! 21. Check for road closures. Due to landslides and too much rain, certain parts of the road could be closed. If you check ahead of time, you can avoid a wasted trip. It's a long drive, and some fun tunes are necessary. You can also purchase a Hana CD that will guide you and narrate the cultural and historical points along the way to Hana. 23. Fill your gas tank to the top. Gas is even more expensive in Hana, if you can believe it. Plus there are no gas stations along the way from Paia to Hana. Check current local Maui gas prices. 24. Don't plan any other activities for the same day. You may want to limit your next day's activities as well. 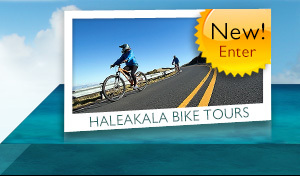 It will take you a full day to enjoy the Road to Hana. We suggest that if you plan on relaxing and having a mellow beach day, you make it for the day after Hana. Even though you'll be sitting still and driving most of the time, the Road to Hana has a tendency to overwhelm the senses and exhaust everyone involved. 1. Don't trespass. We know you probably have the book Maui Revealed. This book is a best seller because it exposes the many different hidden spots that the local Hawaiians hold close to their hearts. The one thing that this book disregards is the local people's privacy. 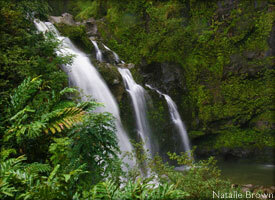 Many of the best spots to visit in Hana are on privately owned land. Imagine having a best seller published about how there's gold in your backyard. The next day you'd find hundreds of gold hungry people digging holes in your flower beds. It's a similar and sad situation with Hana. Even if you're not one of the many disrespectful visitors that trample and trash these areas, you are not welcome on private property. The locals take protecting their land very seriously. You don't want to run across an angry Hawaiian when you're trespassing. 2. Treat everyone with respect, period. 3. Drive safely and pay attention to other drivers. When you stop to one of the many beautiful things along the Road to Hana, Make certain to pull off entirely as to not hinder traffic. Along the same lines, pull over if someone behind you looks like they might be just driving and not sightseeing. Rule #2 is really what it's all about. 4. Offer to take other tourists' photos in front of waterfalls or scenic cliffy coastline. You'll appreciate it when someone does it for you. 5. Drive safely and slowly. The roads are winding and often slick from recent rain. Avoid accidents and possible fatalities by using your head. Switch off driving so that the driver can enjoy the views as well. 6. Pay attention to yield signs. Most of the 54 bridges are all one lane. Almost all of them have yield signs on both sides. Take your appropriate turn. 7. Do not litter. Treat the land as if it was your backyard. In all likelihood, it's some else's back yard. 8. Spread the Aloha with big smiles and waving the shaka. Everyone on the island understands this physical language and appreciates it.